Dawn Lowe, a good friend of Boyne Berries, is involved in a new online magazine called Brilliant Flash Fiction. The magazine is looking for brilliant stories of 1,000 words or less for their first "real" edition to be published at the end of June. They welcome original, unpublished work in all genres: sci-fi, memoir, historic fiction, etc. Email your submission to brilliantflashfiction@gmail.com. Paste your story into the body of your email and also attach it as a .doc file. Do not submit more than two stories quarterly. At present, no payment is available. Authors will enjoy sharing their work with an appreciative audience and the possibility of having their work published in a to-be-announced anthology. More details on the magazine website. 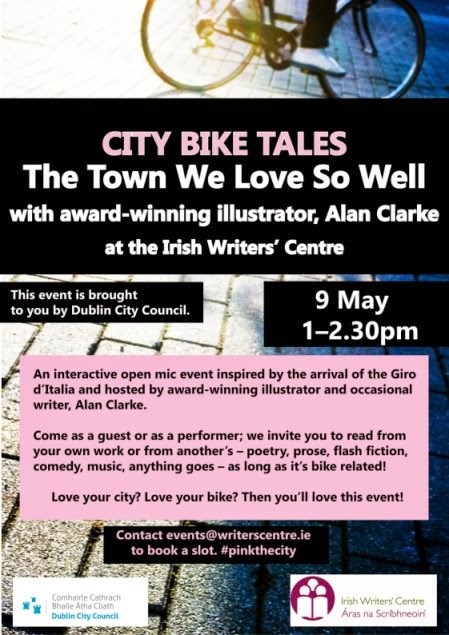 The Irish Writers' Centre has recently launched a lunchtime series 'The Town We Love So Well' and for the next in the series, next Friday 9 May, they have decided to link the city to biking tales, in honour of all the cyclists that will be passing through for the Giro d'Italia. Award-winning illustrator and sometime writer Alan Clarke will be hosting and they're encouraging performances on the day that will link peoples' own cycling experiences – however amateur or professional! – to the world of writing/spoken word. Come as a guest or as a performer; read from your own work or from another's – poetry, prose, flash fiction, comedy, music, anything goes – as long as it's bike related! Slots are filling up so if you're interested please do book in advance to this address: events@writerscentre.ie. Who: Award-winning illustrator and occasional writer Alan Clarke will be MC-ing and the audience will be made up of performers and guests. This event is sponsored by Dublin City Council. Bradshaw Books is pleased to announce the opening of the Cork Literary Review Poetry Manuscript Competition. The prize includes the publication of a first poetry collection by the winning author and twenty free copies of the book. The overall competition winner and two runners-up will also be featured in the next edition of the prestigious Cork Literary Review. 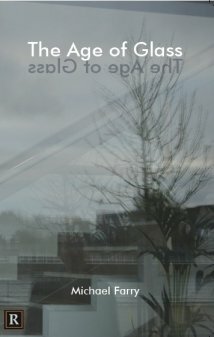 Participation involves an entry fee of 20 Euro and an initial submission of 5 - 10 poems. Upon qualifying for the shortlist of 12, poets will then submit a full manuscript of 50 poems minimum for judgement. This year's judge is Poet and former longstanding Director of Poetry Ireland, Joe Woods. Angela Carr was the 2013 winner with her collection ‘How to Lose Your Home and Save Your Life’. 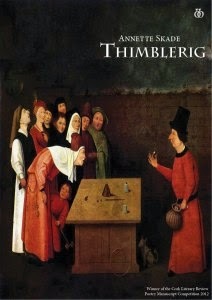 The 2012 Winner was Annette Skade and her collection Thimblerig was published in July 2013. Annette was also the winner of the inaugural Bailieborough Poetry Festival Competition in 2013. Details of the Prolitzer Prize for prose writing 2014 have just been announced. Her poems may be found in several "Open To Interpretation" coffee table books. Her plays have been produced in Seattle, Portland and at the West Coast Ensemble in Hollywood, CA. She was a "Distinguished Writer in Residence" at Seattle University and recently received an Honourable Mention in NIMROD'S Katherine Anne Porter competition. Entries will be judged anonymously. Entries are open until October 1st 2014. Winners will be announced in issue 15 of Prole in December 2014 and on the website by December 15th 2014. Entries may be fiction or creative nonfiction that epitomises the editorial values of Prole: to make writing engaging, accessible, entertaining and challenging. Quality is all. Word limit 2500. All work must be the original work of the writer and be unpublished. Fees: £4.00 for first entry, £3.00 for any subsequent entries. Sebastian Barry's recently published novel The Temporary Gentleman is narrated by John "Jack" McNulty, an Irishman, born in Sligo, whose life spans the first 60 years of the 20th century. The character is based on Barry’s maternal grandfather, Jack O’Hara. Jack McNulty is related to Roseanne McNulty of Barry's The Secret Scripture and to Eneas of The Whereabouts of Eneas McNulty. 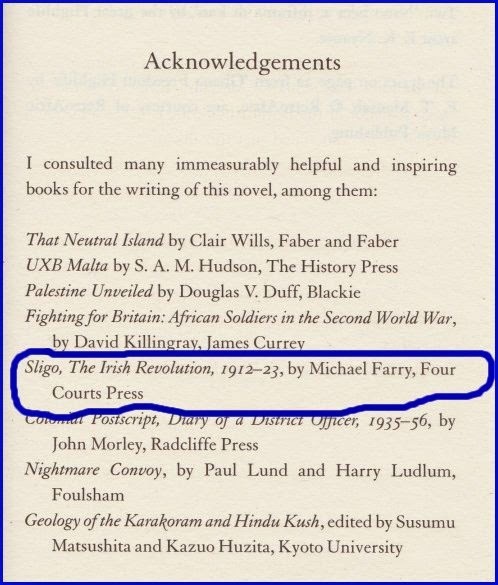 I'm delighted that Sebastian Barry includes my recent history book in his short list of the "immeasurably helpful and inspiring books" which he consulted in the writing of The Temporary Gentleman. Irish Times interview with Barry here. Guardian review of the novel here. 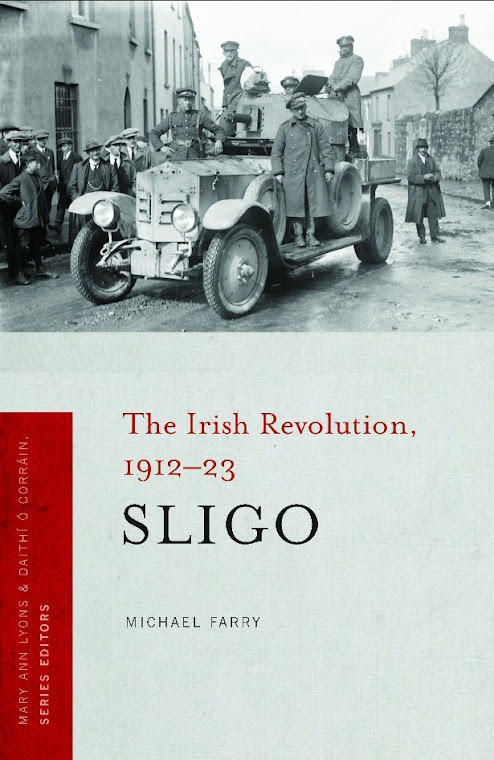 My book is available from the publishers, Four Courts Press, in bookshops and elsewhere online. The tulips are at their best at just the right time. from Tulips by A.E. Stallings. 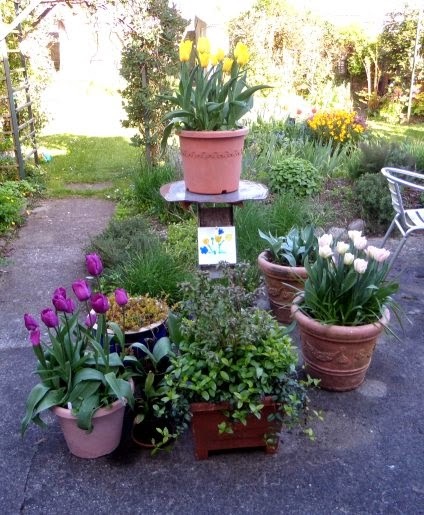 Svlvia Plath's poem Tulips refers to flowers she received while in hospital recovering from an appendectomy. It was written in 1961 and published in her posthumous volume Ariel. 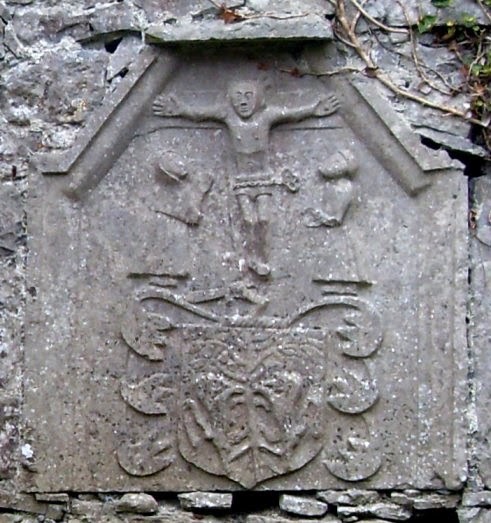 A crucifixion scene from a grave stone in the ruins of Tulsk Dominician Friary, Co Roscommon. More about this site here. Three poems for this day, two well-known, Good Friday, 1613. Riding Westward by John Donne (1572 – 1631), and Easter Wings by George Herbert (1593–1633) and the less well-known, Good Friday, by Scottish poet, Edwin Morgan (1920 – 2010). 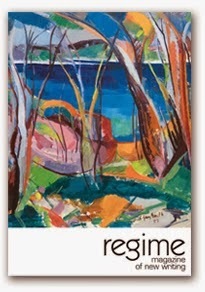 I was lucky to have a poem included in the last issue of the journal, Regime, published in Perth, Western Australia. I was especially pleased that they accepted a poem written as a result of a previous visit to WA. I missed the launch but when I was in Perth in January/February I met three of those involved, Nathan Hondros, Chris Palazzolo and Peter Jefferies, and we had a great chat about poetry, publishing and life in general. Regime Books, the collective which publishes Regime, has just sent out a call for submissions for the next issue, closing date 16 May. Please submit your poetry, short stories, and performance writing before then. Full details on this page. Regime Books is a collective of writers, poets, editors and publishers who are committed to publishing the best writing they can get their hands on. As well as the journal they have published books of stories and poetry. They are also announcing the launch of a new model of community publishing – an idea Regime Books invites writers and poets to join. Regime Magazine of New Writing will remain a not-for-profit enterprise, but also strictly not-for-loss. We want to pay our writers and poets in currency, not copies. We are dedicated to printed editions that are supported (and not replaced) by technology. We will be inviting guest editors. We will consider inviting suitable sponsors, and opening our books to donors. Our cover price will increase to $25 a copy (including postage). Why? $10 per copy sold on our website will be evenly distributed to our talented contributors (contributors will not receive free copies or a distribution from copies sold through third party retailers – the cover price for that is eaten by the printer, bookseller and distributor). There will be 50 poets, 5 short story writers and a performance writer included in Regime 04. There will be two print runs for Regime 04 for orders made through our website. You can also reserve your Regime 04 before it's too late (yes, we're serious, the clock is running out). $10 for every copy sold goes directly to our contributors. Visit the website right now! I'm delighted to have a poem in the current issue of Prole, issue 13. This is my second time to be in this great journal of prose and poetry. This poem, A Pair of Dead Man's Shoes, was well workshopped by the two groups I belong to and also at a great workshop with a great bunch of poets at Cork Spring Poetry Festival 2013 which was led by Carolyn Forché. This issue also contains the winning poems from the Prole Laureate poetry competition, judged by Kate Noakes whose comments on the poems are also included. A poem by Kate is also included. Congratulations to Michael Crowley, winner, Martin Malone and Sarah Grace Logan, runners up. 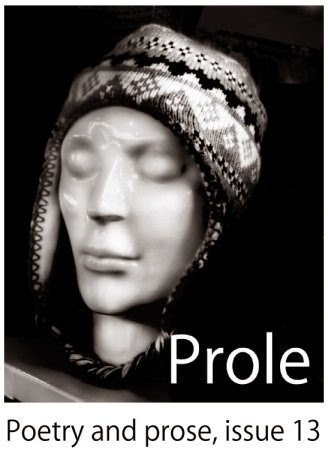 You can buy and enjoy Prole (available as a pdf and as a print version), either this issue or a three issue subscription, by using the options from the drop down menu on the journal's website. 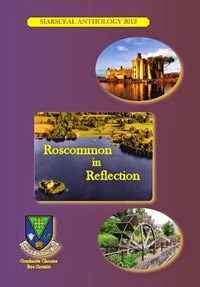 Kindle readers can download for free the SiarScéal Anthology, Roscommon in Reflection, all of this weekend. First published in 2012, in print and e-book editions, the anthology represents the fruit of the first five years of the Hanna Greally Literary Awards. 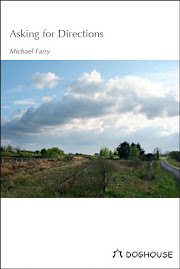 In the Foreword to this volume of poetry and prose, author Dermot Bolger had this to say: "This is a book that emanates from Roscommon and resonates with the landscape and varied stories of Roscommon, but, like all good writing, it slips free of all boundaries and borders to speak directly to the human heart about the human condition." Starting Thursday, 10 April and running for five days, to the following Monday 14 April, Kindle readers can avail of this special promotion, just by logging on to any of the Amazon domains. If you do not already own a Kindle device you can simply download one of the free Kindle Apps to your phone, iPad, tablet, computer or laptop. SiarScéal Festival 2014 will take place on 25 October in Roscommon Town. Entries are now being accepted for the 2014 Hanna Greally Literary Awards.I was lucky enough to win this award last year. This year's overall winner will have their book published for free, in print and e-book editions, courtesy of The Manuscript Publisher. The theme for this year's competition is open, which is all the more reason to get writing. Closing date is Friday, 10 October. SiarScéal Festival 2014 programme of events will also include a writers workshop, presented by Fred Johnston of the Western Writers Centre. Fred is a poet, playwright and novelist. He writes in both English and French. In 2004, he was writer in residence to the Princess Grace Irish Library in Monaco. His his most recent collection of poetry is entitled, Alligator Days. The demise of publisher, Doghouse Books, which was announced late last year, was widely mourned and it was thought that the great work done by the imprint and its editor, Noel King, should be marked. Accordingly, Doghouse Poets and friends present an evening of poetry and song to celebrate Noel King's enormous contributions to poetry in Ireland as well as Doghouse's retirement as a poetry publishing house after ten years and forty nine books. Doghouse will continue to service its published writers until 30 June 2015. Until then, any volume still in print may be ordered through their website. You can get any number of copies postage free for the price of €12 to anywhere in the world. 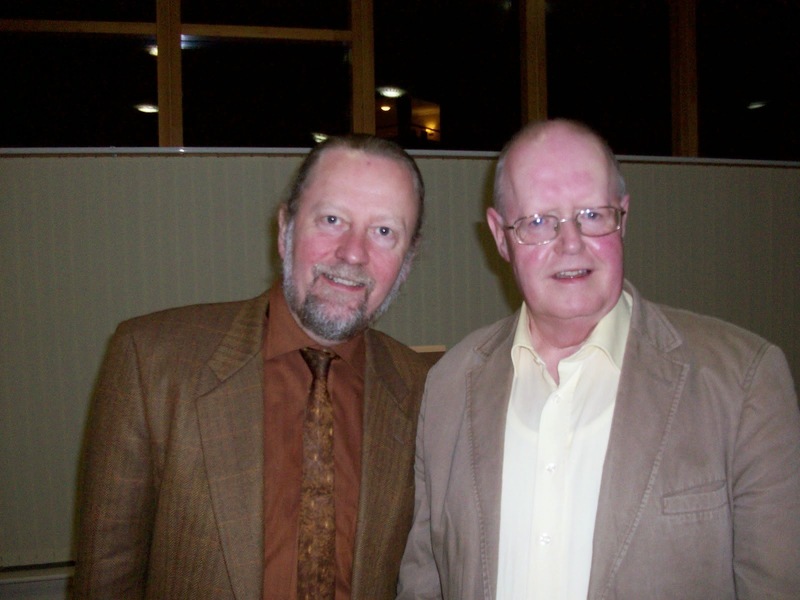 Picture: Noel King with Boyne Writers Chairman, Paddy Smith, at Noel's reading in Trim in 2011. The Yeats Society, Sligo, presents Richard W. Halperin, who will read from his two collections published by Salmon, Anniversary and Shy White Tiger, as well as from a work-in-progress as part of their Poets Parlour series of readings in the Yeats Memorial Building, Hyde Bridge, Sligo tonight Tuesday 1 April 2014 at 8.00pm. Richard’s work has been widely published since 2005, especially in THE SHOp, Cyphers, Revival Literary Journal, The Stinging Fly (featured poet, summer 2009), Ambit, Carillon, The Delinquent, Obsessed with Pipework. Several of his poems have been honoured in competitions in Ireland, the U.K. and Italy. He gave his first reading at Glenstal Abbey and has since read throughout Ireland, including at the Guinness Book of Records marathon, Irish Writers’ Centre, Dublin. Prior to retirement as Chief of Section, UNESCO, he edited Reading and Writing Poetry (Paris, 2005), available gratis via the internet. He is currently working on a third collection Quiet in a Quiet House.